(McAllen, Texas) - We flew down on a cold January day. A dome of Canadian air that seemed to collapse from the arctic top of the world had reached all the way to the sub-tropical region of the Lower Rio Grande Valley of Texas. Nothing kills in the tropics as efficiently as freezing temperatures. Our camera crew drove the roads that stitched together the orange and grapefruit groves and stopped to record the ruined fruit and the tall Washington palms that were certain to also die. And then we began to contemplate the coming economic sadness. In the '80s, the lower valley kept getting knocked backwards by circumstance. Average unemployment was 27 percent and in Starr County it had reached as high as 60. There were two deadly freezes in a matter of a few years, and the peso in Mexico, which made it affordable to purchase American products, was consistently being devalued. There were no jobs, and little reason for optimism. The struggles of the valley have not ended but the reference to the border by Texas Attorney General Greg Abbott, who recently used the term Third World as a descriptive of the region, offended those of us who love la frontera. The GOP candidate for governor, Abbott described the border as practically being destroyed by corruption, although there are no statistics to support his critique. There is, in fact, no evidence of disproportionate wrongdoing along the border. In fact, Abbott, who is a member of the board of the Cancer Prevention and Research Institute of Texas (CPRIT), and others involved with the multibillion-dollar fund, have been the target of a Travis County grand jury investigation over inappropriate awards of research grants and startup investments. Which might prove to be corruption on a grand scale. When I first lived on the Texas border, there were real third world problems. Incomes were the lowest on average in the nation, child mortality rates were higher than normal, unemployment lingered at painful levels, literacy was very low, and so was per capita income. These issues had less to do with the enterprise and aspirations of the people who live along the border than it did with the policies of state government in Austin. Historically, the border, and in particular, the valley was a political afterthought. The sheer inertial energy of population increase and economic growth has changed the political calculus down here in a place where the wind and the innovators remain restless. McAllen, one of the three main cities that comprise the valley metro centers, briefed community leaders on a vision that offers what was once a largely unimaginable future. The McAllen Economic Development Council (MEDC), which began work on transforming the local economy 26 years ago, showed off the city's new winged "M" logo and described a plan to make their community "the most strategic advanced manufacturing area in the world." Political candidates like Abbott, who talk about increasing security on the border by hundreds of law officers, are certain to prompt concern among the communities down here that have grown healthier based upon the free flow of people and businesses on both sides of the river. "We're one community that happens to have a river running through the middle of it; it just so happens ours is an international border," said Keith Patridge, chairman and CEO of the MEDC. "But it does not stop the flow of commerce, it does not stop the flow of families, it does not stop the flow of commerce back and forth across the river and we all have to embrace that." In fact, McAllen's economic vitality is directly related to the Mexican border city of Reynosa. 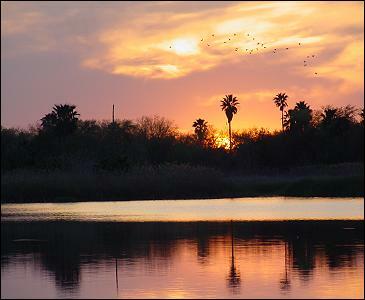 By helping the development of maquiladoras on the other side of the Rio Grande, McAllen and other parts of the valley have grown. The "twin plant" concept allows for the manufacturing of products in Mexico with their assembly and shipment occurring on the U.S. side of the river. There is probably not a car that comes off of an assembly line in Detroit that does not have parts from maquiladoras. While there are still issues over fair wages in Mexico and the migration of jobs from the states, the North American Free Trade Agreement has enabled the twin plant operations and aggressive marketing by McAllen has led to 153,000 new jobs and 657 companies coming to Hidalgo County over the past quarter century. Civic leaders do not even consider it to be hyperbolic when they suggest they can have the same kind of international economy and vitality as Singapore and Hong Kong. And even Austin has begun looking southward. The state has funded a new medical school, which is already under construction in Edinburg, just north of McAllen, and a new university is being formed by the combination of the University of Texas system campuses in Brownsville and UT Pan American. McAllen's South Texas College, which grants two year associates degrees, will continue to serve the region with more than 32,000 students in annual enrollment. In nearby Brownsville, Elon Musk is being courted to bring his Space X launch center to a city that has the lowest per capita income in the U.S. in the hopes that tax breaks from the state and municipal governments, which total $20 million, will create even more jobs. There is no shortage of problems, however, along the border. In Hidalgo County, one out of every three people is believed to still live in a colonia, an unincorporated and unregulated development with limited, and sometimes no public services. Immigrants rush to buy any affordable piece of land to make a stake in America, even if they find themselves outside of the law, and the delivery of basic needs like sewer and water and electricity. No one has found a simple answer on how to manage this difficult growth dynamic, but talk of more border guns and clampdowns leaves people here unsettled. They have their own ideas about the future. And they do not envision a third world.